NASA has selected SpaceX to take over a former space shuttle launch pad at the Kennedy Space Center, the agency announced Friday. The Hawthorne, Calif.-based company will begin negotiations with NASA on a lease to use and operate launch pad 39A, which was the starting point for all of America's moon landing missions and most space shuttle flights, including the first and last launches in 1981 and 2011. The terms of the lease, including the length and value of the deal, will not be revealed until negotiations are complete, NASA said. Led by Elon Musk, founder of PayPal and the electric car company Tesla Motors, SpaceX is already based at a launch pad on U.S. Air Force property a few miles south of pad 39A. But SpaceX has a manifest packed with launches for NASA and commercial customers, and officials expect to add a slate of military missions to its backlog after completing the Air Force's required certification program. Musk told Spaceflight Now in September that SpaceX would shift most of its NASA business to launch pad 39A if the company secured a lease to the seaside complex. Potential launches from pad 39A would include missions for NASA's cargo resupply program to the International Space Station, plus launches of astronauts to the orbiting outpost under the agency's commercial crew program. Musk also suggested launches of interplanetary probes and other deep space missions could originate from pad 39A. According to Musk, SpaceX plans to outfit launch pad 39A for the company's Falcon 9 rocket, which is already flying, and the Falcon Heavy launcher still in development. 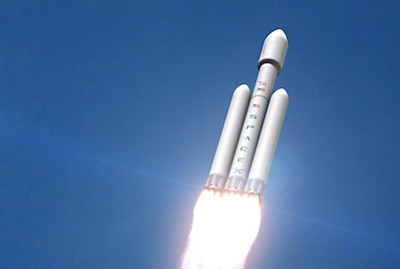 The Falcon Heavy will be capable of lofting more than 100,000 pounds into low Earth orbit by bundling three Falcon 9 first stages together, forming a triple-body rocket with 28 engines. NASA said it decided to open negotiations with SpaceX after the U.S. Government Accountability Office ruled Thursday against a protest filed by Blue Origin, a startup space transportation firm owned by Amazon.com's billionaire founder Jeff Bezos. Blue Origin claimed NASA's solicitation for commercial proposals for pad 39A released in May favored offers outlining ways for multiple types of rockets to use the facility, instead of plans for exclusive use of the pad. The GAO concluded there was no preference for either approach. According to the GAO decision on Blue Origin's protest, SpaceX proposed taking exclusive control of launch pad 39A. Blue Origin's plan called for the complex to be available to multiple rockets. But as Blue Origin's protest went public, drawing letters in support and opposition from members of Congress, SpaceX said it would be open to others using pad 39A. "SpaceX is pleased to have been selected by NASA to enter into final negotiations for the use and operation of the historic launch complex 39A at Kennedy Space Center," SpaceX spokesperson Emily Shanklin wrote in an email Friday. "As previously stated, SpaceX will gladly accommodate other commercial providers interested in using launch complex 39A for NASA human-rated orbital spaceflight." Blue Origin said it stands by its position that pad 39A should be open to multiple companies. "We hope that NASA will preserve options to make this national asset available for multiple commercial users," said Robert Meyerson, president and program manager of Blue Origin, in a statement released Friday. NASA was barred from selecting a tenant for the launch pad while the GAO was deliberating. "However, while the GAO considered the protest, NASA continued evaluating the proposals in order to be prepared to make a selection when permitted to do so," the space agency said in a statement. "After the GAO rendered its decision Thursday in NASA's favor, the agency completed its evaluation and selection process." Blue Origin is working on reusable suborbital and orbital launchers, and it received $25.7 million from NASA's commercial crew program to design and test a hydrogen-fueled rocket engine and a pusher escape system to ferry astronauts away from a failing rocket. 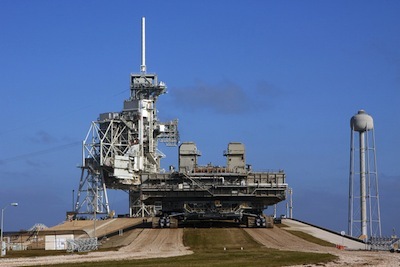 NASA says it has no need for launch pad 39A. The government-developed Space Launch System, which NASA plans to use for human spaceflights such as the planned asteroid rendezvous near the moon, will be based at nearby launch pad 39B. Engineers have removed the shuttle-era service structures from pad 39B and are upgrading the facility to support more modern rockets. Pad 39A cost taxpayers about $100,000 month to maintain in 2012, according to NASA, which said it would have to abandon the pad and let it "rust to the ground" without a commercial operator, the GAO wrote in its decision. The huge Space Launch System, powered by technologies flown on the space shuttle and Delta 4 rockets, is scheduled for its inaugural unmanned test flight in 2017. A crewed mission will follow in 2021, and NASA forecasts no more than one SLS flight per year in the 2020s, even in the best-case scenarios. With such a low flight rate, Kennedy Space Center director Bob Cabana said Wednesday that launch pad 39B could support multiple rockets smaller than the SLS. Engineers are outfitting the launch complex with reconfigurable flame deflectors that could be tailored to different types of rockets, and NASA's decommissioned space shuttle mobile launch platforms are on the list of items to be dispersed to commercial operators such as SpaceX and Blue Origin.